Eagle heads, feet, wings, and feathers are prized for costumes, artwork, and ceremonies. Some collectors are paying roughly a thousand dollars for a golden or bald eagle carcass. Lavin says a better way to get eagle parts is through a federal repository program. 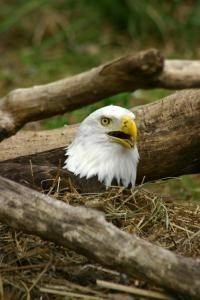 The program sends out carcasses and parts from eagles that have died in the wilderness or in zoos. Special permits for possessing and gathering feathers can also be given to those with government-issued Certificates of Indian Birth.